Women who are obese when they are diagnosed with breast cancer have a 33% higher risk of recurrence and death, when compared with normal weight women. Women who are physically active after being diagnosed have a lower risk of cancer recurrence and death—a far greater association than any medical treatment. A meta-analysis of a total of over 12,000 breast cancer survivors showed that postdiagnosis physical activity was associated with a 24% and 34% lower rate of breast cancer recurrence and death, respectively, and a 41% lower rate of all-cause death. Women who gain weight after diagnosis have a higher risk of recurrence and death, no matter what their weight at the time of diagnosis. Aerobic Exercise – Never Going Out of Style! Remember when Marcia Griffith led us in a four line dance back in the 70s? Little did we know that this combination of slide, turn, and clap would remain a popular hit through the decades! Many family reunions and birthday parties start the dance hour off with The Electric Slide because the moves are easy to follow and raise people’s energy to a point that can only be released through laughter. When I think about all the times I have electric boogied in a square across the floor, what I remember most is the joy of the people around me. Dancing with other people is a great way to get your aerobics in while gaining strength just from being around another person. Throw on your favorite playlist, and you’ve created an instant dance studio at any location. Here’s a clip of us having fun, getting our DanceExercise on in the Moving For Life Dance to Recovery DVD. We’ve got other moves too! Click here to check out our DVD! Posted on July 22, 2014 Categories UncategorizedLeave a comment on Aerobic Exercise – Never Going Out of Style! Summer is the time to take advantage of the health benefits naturally gifted by mother earth. The hardest to miss is of course, the sun! 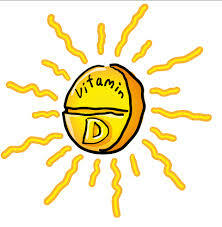 Time in the sun means access to vitamin D that helps your body absorb calcium. 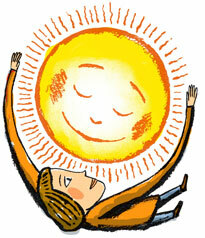 Amongst many other benefits, the sun’s exposure cues production of melatonin and serotonin. Therefore by getting outside and soaking in some rays, your ability to sleep restfully at night and wake up in a better mood can improve immensely. Unfortunately, there is also such a thing as overexposure to ultraviolet (UV) rays from the sun. Protection could mean limiting one’s time, or simply going out into the world prepared for an extended time. The most potent method of skin protection over time is staying under shade. An umbrella at the beach or carried around at the park is useful in avoiding extended periods of direct UV rays. Sunglasses are the equivalent of this for the eyes. Clothes that cover the skin can also deter too much sun. When it comes to being in the sun, it is important to remember that there is potential for too much of a good thing. Higher concentrations of ultraviolet light significantly increase risk of skin cancer by damaging cells in the dermis. 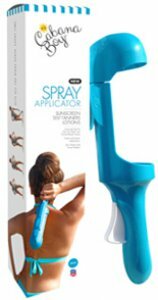 As we enjoy our outdoor pursuits, let us be conscious of the good we are doing by being outside, but prevent long term skin damage with simple practices meant to protect us. Sunday June 8th is looking sunny and warm so don’t waste it on your couch. With a high of 84 degrees not happening til later in the day we have the perfect morning planned out for you. 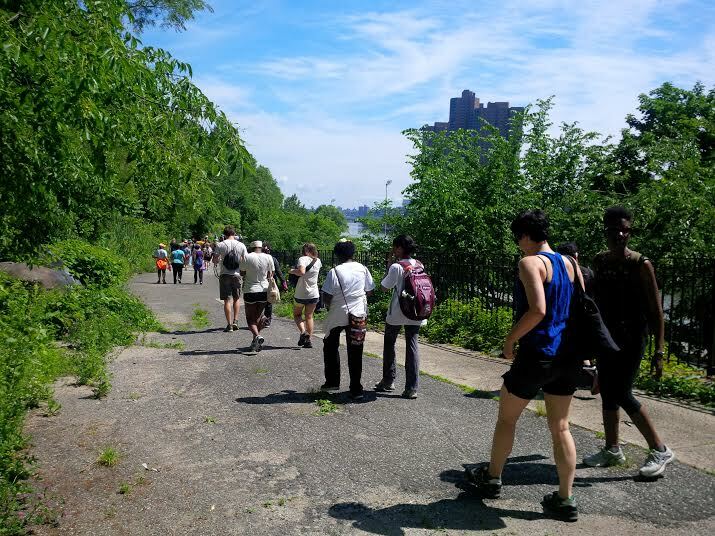 The Green Gym Day gets you moving your way through several of our very own beautiful upper Manhattan New York City parks. Also as part of a partnership with Moving For Life, this initiative invites you to indulge in dancing and stretching breaks, or just moving the MFL way – easy walks with lots of smiles. Not only do you get to spend the day outside, walking through parks with friendly people, having fun and getting some exercise – it’s all done for a good cause. You can invite a friend to sponsor your walk or if you can’t join us you can sponsor another participant to honor a loved one. Click here to become a sponsor . If you raise $50, Moving For Life will gift you an MFL t-shirt. You can always buy one for $10; we accept sponsorship donations of any amount, and remember – Moving for Life is a non-profit agency. For those walkers shy about sponsorship, don’t worry. We will find sponsors for you! Your presence on Sunday is the most valuable support we can receive. Remember to register through info@movingforlife.org to reserve a t-shirt size and adhesive logo. You will unfortunately have to wait till September for the next MFL event so don’t miss this one. See you there! 9 am: Jackie Robinson Park (145th st & Edgecomb ave) – meet, stretch, and warm up. 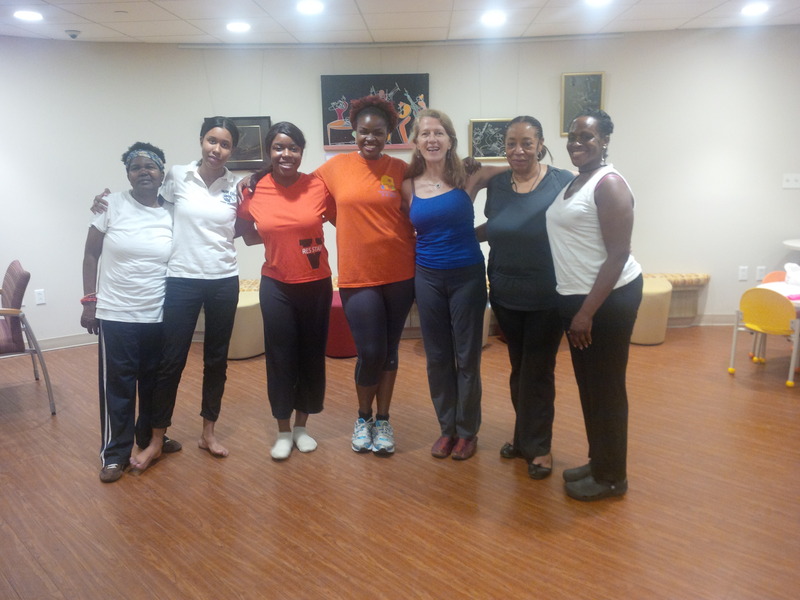 10:30 am: Highbridge Park (174th st & Amsterdam ave) – dance, take a stretch break. 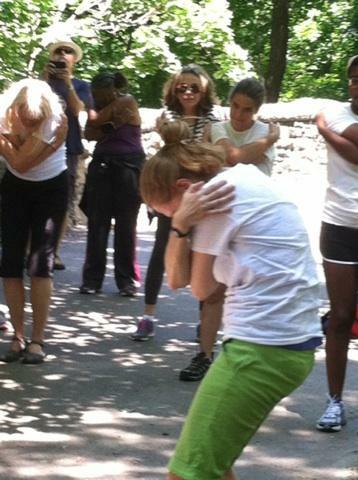 11:30 am: Swindler Cove (Dyckman st & 10th ave) – dance, take a stretch break. 12:00 pm: RING Garden (Dyckman st & Broadway) – look at the fish! 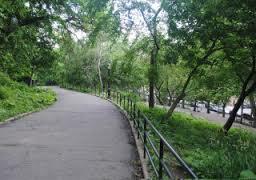 12:30 pm: Fort Tryon Park (Cloisters & Heather Garden) – stretch, cool down, BYOP (bring your own picnic!) or grab a bite at New Leaf Café. 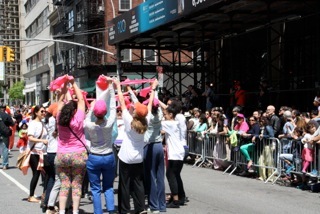 On Saturday May 17th, Moving For Life celebrated its sixth year in the New York City Dance Parade, The parade widely recognizes the culmination of dances from all over the world and this year, serenaded 142 dance groups of different styles and origin down Broadway. 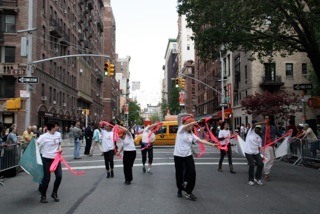 The MFL troop was ready, with pink therabands in hand, to show New York the power in group dance. The energy was shared amongst all the participants in the parade. There is an unquestionable strength that comes from the collaboration of individual styles, all working together towards one goal. MFL’s goal was to show New York City their easy to follow gentle aerobic technique that alleviate symptoms accompanying cancer treatment and recovery. Others enjoyed the benefit that came from addressing these symptoms as well – the high stress levels, blood pressure, the joint pain, or fatigue. As the benefits become more widely recognized since MFL’s advocacy for movement sixteen years ago, experiences like the Dance Parade remind us of the strength in numbers. We took turns leading and following the group dance. Transitions included my favorite, the “breathing circle”, where everyone gathers together in a huddle; we’d smile, check in with our eyes, and step back with a loud exhale. Even when we weren’t all hitting the same moves, we always felt in sync with each other. For two miles, we kept our blood pumping down Broadway. Across further distances, back to our homes and our Moving For Life classrooms, we carried the energy to self improve and the excitement to witness the advancement of our fellow dancers. We feel the strong empowerment in our community; imagine a community that not only promotes health, but also is eager to share specific movements that are known to improve the physical and incorporeal state of being. The MFL community believes in sharing knowledge while teaching those who need it most, because the life of a community only further promotes overall wellness. Such is the life on an MFL dancer. This weekend, Moving For Life will again band together outdoors and use the City as our fitness event platform. 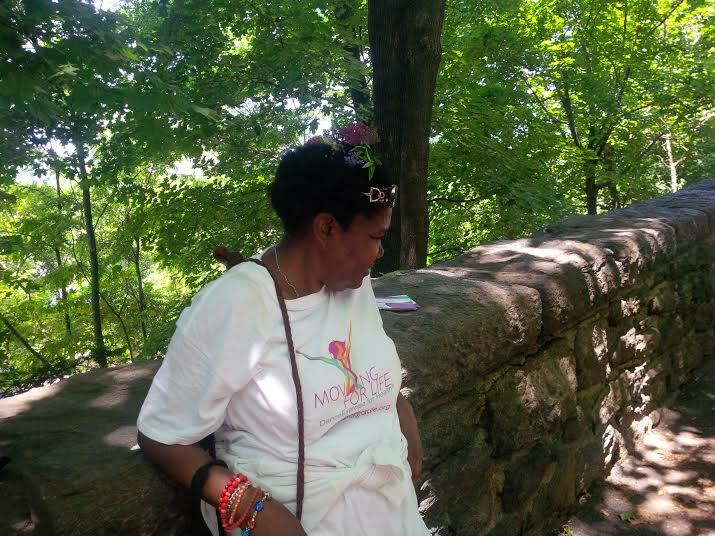 On Sunday, June 8th we will be meeting at Jackie Robinson Park (145th St & Edgecomb Ave, near ABCD trains) at 9am and continue to walk through NYC parks until ending at Heather Garden in Fort Tryon Park. Save the date, Sunday June 8th! Click here to become a sponsor. All proceeds go towards offering free MFL classes in underserved neighborhoods. Moving your way to a better stronger you! I was first exposed to Moving For Life (MFL) through my endless late night hours of Internet research, desperately trying to find an organization, institute or even a person that works with cancer patients through exercise. I knew it existed and I knew the remarkable positive impact movement has on those going through treatment and recovery, but finding the right source was certainly a mission. Till one day Icame across a non-profit organization that was founded by reputable professionals comprised of breastcancersurvivors, movement therapists, psychologists, medical doctors and concerned physicians. Their personal stories initiated the creation of Moving For Life – a healthy exercise program medically endorsed by numerous surgeons, oncologists and social workers (and engaged in research with NYU Langone Medical Center), that uses gentle aerobics, dance and fitness related exercises to help regain immunity, mental and physical strength while fighting all symptoms of treatment such as fatigue, neuropathy, lymphedema and an overall depleted self. I immediately wrote an email to MFL all the way from India, one that could be considered very far from a formal introductory description of my professional capabilities and very close to an informal personal story from the heart. I hardly expected a response, but to my surprise I got it soon after from a woman named Martha. I then learnt in the coming weeks that Dr. Martha Eddy, one of the co-founders of MFL is a reputable Exercise Physiologist, and Registered Movement Therapist (RSMT) with a doctorate from Columbia University in Movement Science and Education and a world-renowned dance educator. She was one of the early founders of the cancer exercise profession. I started to recognize how fortunate I was to be in such distinguished company. Samara in action at the dance parade! if had more energy than usual, but everyon Continue reading Moving your way to a better stronger you! Posted on May 23, 2014 June 2, 2014 Categories Cancer Recovery, Conscious Fitness, Mindful MovementTags cancer recovery, dance, DVD, exercise, Moving For LifeLeave a comment on Moving your way to a better stronger you!